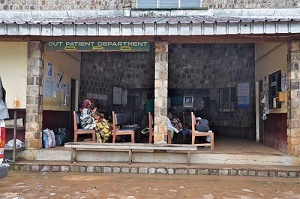 The hospital is located in a rural area of the Northwest Region of Cameroon. It has 310 beds including an array of surgical, orthopedic, general medical, infectious disease/isolation, pediatric, maternity and chronic wound care beds. There is no ambulance service in this area of Cameroon and the hospital daily receives patients suffering from serious medical conditions such as heart failure, diabetes and HIV/AIDS with serious infection. It also receives a high volume of vehicular trauma, as well as many surgical cases such as bowel obstruction or perforation, many forms of cancer and now frequent gunshot wounds as well. There is no emergency department. 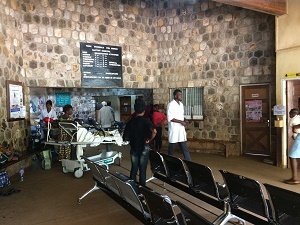 All patients arrive by private vehicle, taxi or on foot and present to the Outpatient Department which is not equipped, staffed or built to handle major cases requiring emergency treatment or resuscitation. One way or another these critical patients are moved to a medical ward, the OR or the ICU for their initial assessment, stabilization and treatment causing unnecessary and dangerous delay. This also causes disruption to the operation of these areas of the hospital.